Yesterday, in Part I of our series on men vs. women, we looked at the evolution of the world record in the marathon event, and how the relatively late entry of women into the event threw a few “scientific” predictions off course! The theory has long been that in the longer distance events, women would close the gap on men for two major reasons. Firstly, the strength advantage enjoyed by men is less significant to success in those longer events, and so women might be able to hold their own when it is endurance, rather than power that is important. In today’s Part II, we look at this issue in a little more detail, and expand our scope from marathons to include ALL the track running events, as well as events longer than marathons. Our approach is to compare the women’s best ever performances to the best ever performances by men and measure the difference between them. By looking at the full spectrum of running events, from 100m to the ultra long distance 100mile races, we can obtain an idea of whether women do begin to approach men as the distance increases. The hypothesis would be that if women enjoy a relatively greater advantage in endurance events, then performance gaps will be large in the short sprint events, but will come down in the longer events. There are a couple of things to bear in mind, however. First of all, one must again acknowledge that women have not enjoyed the same length of time to participate in the events as men, being barred from competing until relatively recently. And so as with the marathon, they are at very different phases in their life-cycles. The biggest implication of this is that the depth of talent that have attempted certain distances is not the same as for the men. Therefore, it’s quite possible that we are comparing the best men against women who may not actually be the very best or most talented, especially at the ultra-distances, where perhaps 20% of the entire field might be women. I realise this may sound harsh, but what the passage of time does is refine the group of participants, and this may not have happened in the women’s events, particularly the very long duration ones like Comrades. The graph below shows the difference in performance (plotted as % difference) between men and women over the full range of distances from 100 m all the way to the marathon. The graph shows that the women’s record is in general about 10 to 12% slower than the men’s time (granted, some the women’s world records are extremely suspect because of drug use!). Paula Radcliffe’s marathon record brings the gap down to 8%, Frith van der Merwe’s Comrades record is 11% slower, and Ann Trason’s record in a 100-mile event in the USA is 13% slower. So all in all, the trend doesn’t seem to be that over this range of distances, anyway, that women are on course to catch men as the distance gets longer. What is even more interesting, and which points to the reason for the dominance of men over women, particularly in the shorter distances, is that over the last 10 years, the performance gaps have gotten even WIDER. The reason, as you may have already guessed, has been suggested to be the use of drugs in sport, which was absolutely common-place in the 1970’s and 1980’s. If you look at the world records (which are half the equation in the graph shown above), then you will see that from the 100m event up to the 1500m event, the world record in women’s events was set in the 1980’s. Think Florence Griffith Joyner, Marita Koch, Kratochvilova. We know that doping was rife in the Eastern Bloc countries in particular, and there’s no reason to think it was any less so in the USA. In the middle and long distance events, you have the Chinese of the early 1990’s who hold most of the world records, and that was widely speculated to be due to doping. I suspect that some of these records will NEVER be broken. The women’s 400m record, for example, stands at 47.60 s (Marita Koch of Germany, set in 1985). No one has even come within a second of this since. It’s highly unlikely they ever will. But whereas doping practices were largely uncontrolled during the 1980’s when these records were set, there are now much stricter methods in place. And although the use of drugs is probably still wide-spread, as indicated by Marion Jones’ story and our recent posts on doping in sport, it is a very real possibility that the reason the gap is widening is because the use of anabolic-androgenic agents in women is decreasing. This theory, proposed by a scientist from Norway (Stephen Seiler) and a market researcher from Chicago (Steven Sailer – a bizarre co-incidence that the names are so similar! ), attributes the flattening out of women’s performances to the tightening up of doping control, which has narrowed the “hormone gap”. So while men have continued to improve (the 100m world record has been broken five times in the last 2 years), the women have levelled off, possibly due to the greater control over these anabolic-androgenic agents. So what are anabolic-androgenic agents? Well, think steroids. Testosterone, stanozolol (Ben Johnson’s drug in 1998), THG (Marion Jones) etc. These are drugs that have what is caused an anabolic and an androgenic effect. Anabolic means growth, and androgenic is ‘masculinizing’ – to be crude, they turn women into ‘men’. That is, they increase lean mass, they reduce body fat percentage, the stimulate the development and hypertrophy (growth) of muscles. Often, they have some rather undesirable consequences, including excessive hair growth (a tell tale sign when you look at videos of athletes in the 1980’s) and rather more seriously, shrinkage of the female reproductive system, and even the growth of male reproductive tissues in women! But the point is that these drugs bridge the gap between men and women, physiologically speaking. We said in Part I of this series that perhaps the biggest difference between men and women, physically speaking, is that men produce the hormone testosterone, and it stimulates all the above mentioned changes. The result is that men have more muscle, less fat. This translates into more strength. The use of artificial testosterone (or any other steroid) means that this advantage is reduced, and so the women who were using the drugs were able to produce performances that were much closer to those of men, as seen on the graph above. Now that the testing process is tighter, the gap is widening. In this way, a bizarre observation points to the key difference that makes men faster than women. Right, so we’ve now seen that in distances shorter than the marathon, the fastest women are unlikely to outrun the fastest men (thanks to testosterone, chalk one up for the men!). 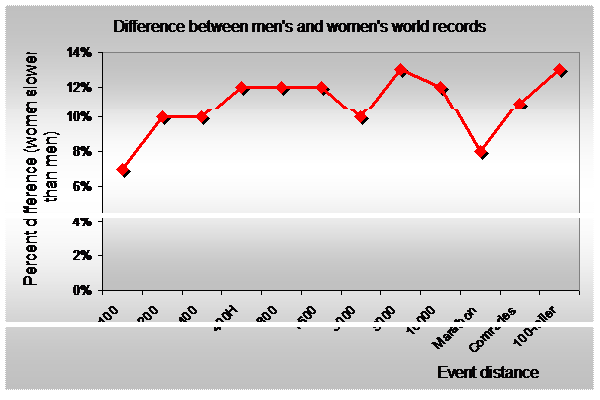 We’ve also seen that there doesn’t appear to be major difference in the world records between men and women as the event gets longer. And while this is a hazardous method, it does suggest that the women’s world record will never equal or surpass the men’s record, no matter how long the run (another sigh of relief for the men!). But that is the topic for the next Post, Part III of the series, which we’ll look at tomorrow!